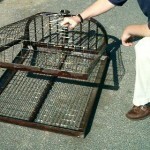 BEAVER EASY SET 15" x 29" x 36"
PRODUCT DESCRIPTION: Live trap that is the latest design similar to older, more traditional suitcase traps. The great thing about the Easy Set is that you can use it for practically any situation. It's strength is that you can set it in water and use the top of the trap as a canopy. It's long been known that beaver like to stay close to cover and over hanging vegetation is the kind of cover they like. The Easy Set can be configured to support a bunch of vegetation and in turn make it appear as a "safe" place for foraging beaver. It features a very easy setting mechanism so anyone can handle the trap without being in danger like some of the older designs. Make sets with bait like sticks which are freshly debarked and saturated with Poplar Oil for best results. 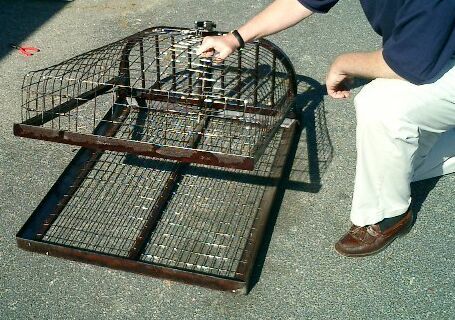 This trap has a fairly rigid design made with a heavy steel base and thick gauge wire to insure trapped animals cannot chew their way out. The trap measures 15" tall by 29" deep by 36" wide. WHERE TO USE IT: On land, beaver mounds, dams, shoreline, ledges and where beaver have been seen. Sets are limited to your imagination but best when made on firm footing. RATE OF APPLICATION: The more traps used at one time the better and faster results you will obtain.